During the boom, Ireland had the highest population growth in the EU. In part this was because it had the by far highest birth rate and because of that the highest rate of natural increase, but mainly because of very high net immigration. After the recession started, the high level of net immigration has been reversed and now Ireland has significant net emigration. However, its population isn't shrinking because the rate of natural increase has been more or less unchanged at the previous high level. Amazingly, the number of births in the second quarter last year, was exactly the same, 18,844 , as in the second quarter of 2010. I wonder what the odds of that is? What Effects Will Unrest In Egypt Have? Market distress increased last week because civil unrest in Egypt, and as that has gotten even worse over the weekend, market distress will likely continue. 1) The Mubarak regime holds on to power. 2) A secularist democratic opposition takes over. 3) The islamist fundamentalist Muslim brotherhood takes over. In the two first scenarios nothing will happen to the world economy, apart from an insignificant short-term effect from the depressing effects on the Egyptian economy caused by the unrest. In the third scenario some problems could arise. Not so much because of the Egyptian economy. GDP at current exchange rates was only $215 billion in 2010, less than in Israel and Finland, and less than 1.5% of the U.S. economy, so the world economy would barely notice a weakening of the Egyptian economy. What could cause unrest however would be if the Muslim brotherhood would decide to take a confrontational stance against the United States and Israel by for example closing the Suez Canal or to start a war with Israel together with Syria and Hezbollah using the large quantities of technologically advanced weapons Egypt has received from the United States the last three decades. This could further destabilize the region and cause some disruptions in oil shipments. That would have a significant negative effect on the global economy. The risk of that is small, but markets are right to price in a small risk. When people argue that Iceland has performed better, or more correctly less bad, than Ireland they use the fact that unemployment in Iceland has risen less while employment has dropped less than in Ireland. This is true. The unemployment rate in Iceland has increased "only" 5.5 percentage points (from 1.9% to 7.4%) during the last 3 years, while employment has dropped 7.6% relative to the population (from 80.1% to 74.0%). The unemployment rate in Ireland meanwhile increased by 8.9 percentage points (from 4.7% to 13.6%), while the employment rate has dropped 13.3% relative to population (from 61.05% to 52.95%. This number it could be noted is in part lower than in Iceland because the population it is compared to include people older than 65). However, the situation for those that are still employed has developed much more favorably in Ireland than in Iceland. In Iceland, the average work week has dropped by 6.1% while real average hourly earnings are down by 8%, meaning that real average weekly earnings have dropped as much as 13.6%. By contrast, the average work week in Ireland has dropped by only 2.4%, while real average hourly earnings are actually up by 1.7%, meaning that real average weekly earnings dropped by only 0.7%. Average labor market earnings for the entire population, which is a function of how the employment rate and average real weekly earnings, thus ended up falling a lot more in Iceland, 20.2%, than in Ireland, 14%. Clearly, the Irish situation is very bad, but the Icelandic situation is even worse, "despite", or more accurately because of its massive currency debasement. The British Weather Services criticizes the view that the very weak U.K. GDP number published earlier this week was due to bad weather, claiming that "where there is a "weather loser" there is a "weather winner" on the opposite side of the fence". I disagree with that view, as is illustrated by the fact that far more companies reported negative weather effects than positive weather effects. However, they do have a point in the sense that there are winners and that this to some extent (but far from fully) counteracts the negative effects. This in turn means that the negative net effect probably wasn't as great as the British statistics bureau estimated. One business that booms whenever there is unusually large quantities of snow is the snow removal business. Increased snow removal counts (when it is paid) as economic activity in GDP statistics. However, as their activity only removes something negative that usually doesn't exist, this "prosperity" created by snow is as illusory as a new window replacing one that has been broken. For this reason, the net negative effect on the economic well-being of Britons will be greater than the net negative effect on GDP. Johnny Munkhammar, one of the most consistent free market advocates in Sweden's leading centre-right party, the Moderates, has an article in the Wall Street Journal explaining why the relative success of the Swedish economy recently is not due to its welfare state, and is in fact on the contrary the result of policies implemented in recent years to downsize it, with an emphasis on supply-side measures to improve incentives. This argument is partly correct. It is clearly the case that long-term interest rates are strongly influenced by expectations of future short-term interest rates. 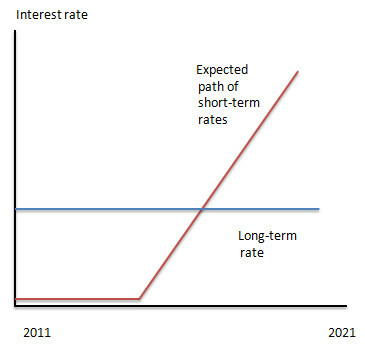 However, it is also the case that largely because of central bank intervention, actual short-term rates tend to be lower on a long-term basis than long-term rates. Only briefly during cyclical peaks are short-term rates higher, meaning that borrowing short and lending long is a long term winning strategy. Here is a chart comparing the 5-year Treasury security yield with the Fed funds rate during the latest 10 years. As you can see, the Fed funds rate was almost always below the 5-year yield. The same thing holds true if you compare it to the 10-year yield, except that the gap was usually even greater. Furthermore, the greater the extent to which the Fed chooses to surprise on the downside compared to expectations, the greater will the subsidy be. Today's U.K. GDP number was much weaker than expected, showing a 0.5% (2% at an annualized rate) quarterly contraction, while most economists had expected a 0.5% expansion. I for one thought that was over-optimistic,particularly given the weather, and expected a growth number around zero, but the real number proved to be even weaker than that. This contraction is blamed on the weather factor, with December being the coldest in 100 years. And I certainly agree that the weather depressed the U.K. economy, and the reversal of this will boost future growth numbers. However, with growth being zero even excluding the weather effect, underlying growth seems to be very weak too. And even with growth weakening, consumer price inflation rose to a new high of 3.7% in December, creating a picture of stagflation inthe U.K. The VAT increase that was just implemented will enhance this stagflationary trend, as it both reduces real output while boosting price inflation. The VAT increase along with a weak underlying economy create a risk of a double dip recession in the U.K. However, the probability of that is probably less than 50% given the reversal in the weather factor and the fact that most economies of the rest of Europe as well as most of the rest of the world, seem to be picking up speed, something which will help counter the contractionary factors. Have The Bank Bail-Out Really Ended? Axel Leijonhufvud points out that the Fed's current interest rate policy means massive subsidies to the banking sector, and that the supposed "repayment" of bailout money was largely made with that subsidy money. Or as I myself put it last year , bankers make hugh profits and bonuses for performing "the extremely sophisticated and socially useful task of borrowing short from one government agency (the Fed) and lending long to another (The U.S. Treasury department)". 325 Basis Point Cut Is No Loosening? Paul Krugman accuses the ECB of being hypocritical for now warning about inflation after the all-items index rose above 2%, while the "core" index has increased only about 1%. He claims that the ECB didn't talk about the need for loosening when inflation fell dramatically (and in fact contrary to his chart,it fell below zero, but never mind that since that would seemingly strengthen Krugman's case) in 2008-09. Well, I don't know how much they talked, but they did act, lowering its refinancing rate from 4.25% in early October 2008 to 1% seven months later, in early May 2009. That is a far more dramatic change than any rate increases in ECB history. It for example 2½ years (30 months) for them to raise interest rates from 2% to 4.25%. So if there is any hypocrisy, it is with a pro-inflation tilt. While some other central banks were even faster in reducing interest rates, that doesn't change the fact that the ECB has been more eager to reduce interest rates than to raise them. Scott Sumner recently argued that the fact that housing starts fell significantly between early 2006 and the spring of 2008 without any significant increase in unemployment, something which according to Sumner proved that it wasn't the housing bust that caused the increase in unemployment, but a drop in nominal GDP (NGDP). Bob Murphy replied here . His argument was in short that Sumner was focusing on the wrong data, overlooking the fact that construction employment developed similar (but greater in terms of percentage) to overall employment, something he argues might be due to work on previously built homes. He also mentions how housing prices supports this story, but fails to fully spell out all the implications of this, something which I will elaborate upon below. Scott Sumner replied to Murphy here arguing that the smaller decline in construction employment until 2008 was the result of a continued boom in commercial real estate or non-residential construction. Murphy responded to Sumner's response here by arguing that Sumner had confirmed his arguments of construction workers being needed to maintain old homes. Actually, he hadn't mentioned that point, and had instead discussed non-residential construction which follows a somewhat different cycle than residential construction. What's to make of this? Well, data on the real value of different type of construction spending confirms partially both Murphy's and Sumner's points. Between its peak in Q4 2005 and Q2 2008, real residential construction fell 41%. That is less than the 50% decline in new homes that Sumner tried to point to, suggesting that work on existing houses helped reduce the decline in residential construction activity. But the main reason why construction employment fell so little was a boom in non-residential construction (called "structures" in GDP statistics) , which expanded by 33% during that period. Does this mean that Sumner is right and that it was the decline in NGDP rather than the end of the housing bubble that caused the recession? No, because first of all Sumner wrongly assumes that the end of the housing bubble had nothing to do with the NGDP decline and that the NGDP decline were completely predictable and preventable. I will however not elaborate upon this point for now, but I will probably soon return to this issue. Secondly, to understand this situation we must first differentiate between the late 2005 to late 2007 period and the late 2007 to mid 2008 period. The first period featured a continued, albeit slow, overall expansion, the second period featured the beginning of the 2007-09 recession. A recession is usually defined in terms of real output and not employment. Why didn't the contraction in residential construction cause an overall contraction in the economy if housing was the key factor? Well, basically for the same reason that the big 2001 contraction in non-residential investments didn't cause more than a very shallow recession: namely that there were a bubble in another sector. In 2001 that was residential construction, in 2006-07 it was non-residential construction. Furthermore, house prices peaked much later (in 2007) than housing construction, something which helped fuel unsustainable level of borrowing for consumption as people used their houses as ATMs. Then there is the issue of why unemployment rose so little during the first 6 months of the recession, and then rise dramatically during the following 6 months. Well, this is clearly related to the fact that real hourly wages was reduced by 1.5% during the first 6 months (after having previously dropped by 1% during the 6 months before that), only to increase as much as 5% during the following 6 months. The big drop in employment was thus mainly the result not of a contraction in real output, but from a big real wage shock. The big decline in NGDP thus didn't primarily lower real output, it instead because of a sudden change from high inflation to deflation and nominal wage rigidity redistributed from people who lost their jobs to people who held on to their jobs. Will Debt Crisis Increase Euro Area Inflation? There is worry in Germany that ECB purchases of government bonds will cause inflation. But that will only be the case if the ECB breaks its pledge to "sterilize" the bond purchases by selling other assets. To the extent the purchases are sterilized by sales of other assets, it will have no effect at all on either money supply growth or price inflation. Similarly, the loans that other euro area governments gives to Greece and Ireland (and in the future possibly Portugal and Spain) are not inflationary since they are financed by the sale of bonds. The "purchase of bonds" from Greece and Ireland are thus in effect "sterilized" by equal size sales of bonds from the other governments. The effect of fiscal austerity on inflation that the debt crisis have made governments implement depends on whether or not a country has increased consumption taxes or not. For countries that have increased consumption taxes, the short-term effect will be to raise price inflation, something we have seen in particularly Greece, Portugal and Spain. For Germany and other euro area countries, particularly those that have focused on spending cuts in their austerity program, the effect will be deflationary for reasons that I explained here. Thus, assuming that ECB really keeps its pledge to "sterilize" bond purchases and do not let the crisis affect its interest rate policy, the effect of the response to the crisis will in fact be the opposite of what is assumed in Germany. However, that is arguably two questionable assumptions. Despite some hawkish comments from Jean-Claude Trichet earlier this week. it is highly unlikely that the ECB will really raise interest rates as long as the crisis is not perceived to be over. For the same reasons, the ECB might not sterilize its purchases fully. That means that ECB rate hikes could come later than they otherwise would have and that its balance sheet could increase, something which would counteract the deflationary effects of spending cuts, and perhaps even mean that the net effect will be to increase inflation. Paul Krugman argues that the view that much of the boom during the housing bubble represented useless production, and that there thus isn't any excess aggregate supply relative to aggregate demand, is false because regardless of whether it was useful or not, it was still produced. Therefore he argues that it makes sense to extend growth from that period to estimate "potential GDP". But even setting aside the general problems with that concept, Krugman's argument contains two more problems. First of all, industrial capacity has declined in recent years, whereas it during the previous boom expanded. This by itself clearly suggests that potential output has grown more slowly, or more likely not at all. And secondly and more importantly, the key issue isn't whether or not it is possible to produce more things, the issue is whether or not it is possible to increase production of more useful things. And while Keynesians and most other non-Austrians thinks that factors of production are basically homogenous, in reality they are to varying degree specific to certain lines of production, meaning that when for example people no longer demand new construction, this means that the factors of production that specialize in that can't be used, or at least have a lower degree of usefulness in other areas. This means that the value they can generate is lower than the apparent value they had as malinvestments during the previous boom. This implies that the capacity to produce things which are still considered useful has likely fallen even more than the official capacity numbers. A bizzaro world type notion that Iceland is some kind of role model continues to be spread. I discussed this last year here when being authored by some infamous pro-inflationists ,but I now saw this published on the normally sensible Ludwig von Mises Institute web page written by someone called David Howden. He claimed, using only a blog post he wrote at the Adam Smith Institute as a source, that Iceland had suddenly eliminated its deficit after its access to the financial markets were in effect cut off. But while it is true that the Icelandic government lost access to credit markets after its de facton default, it is not true that its deficit was eliminated, as it had a deficit of 6.7% of GDP in the first three quarters of 2010. While that did represent a significant improvement on the 9.6% deficit it had in the first three quarters in 2009, it was worse than all other previous years in Iceland and it certainly wasn't even close to a balanced budget. The reason that this is possible is that Iceland is dependent on bail-outs from the IMF and foreign governments in the same way that Greece and Ireland is. While Howden in the blog post in a final note did acknowledge that Iceland was dependent on bail-outs, he failed to note that this undercut most of what he had written before as well as what he would write in the Mises article. Furthermore, Howden claims that Iceland has returned to growth. But in reality, the opposite is true. According to figures released today, Iceland's employment rate fell from 74.9% in Q4 2009 to 74.0% in Q4 2010 (before the crisis it was more than 80%). Moreover, the average work week fell from 38.9 hours to 38.3 hour (before the crisis it was 40.8), suggesting a 2.7% decline in average hour worked per person in the working age population. That means that despite a 2% increase in real hourly wages. real aggregate labor income continues to fall three years into the crisis, after having previously fallen during the previous two years by roughly 20%. Some pundits have recently suggested that the continued high unemployment and low employment in the U.S., is in part the result of some long term structural factyors resulting from high tech and globalization and in part the result of a lack of labor regulations. Regarding globalization, trade with China is the most popular scape goat. Yet Hong Kong, whose by far biggest trading partner is mainland China, whose economy is at least as technological and far more globalized (Both exports and imports are significantly bigger than GDP) and who is the world's freest economy, saw its unemployment rate drop to 4%, while its underemployment rate (the share of workers who work part time even though they would prefer a full-time job) fell to 1.8%. The underemployment rate was at a new low while the full time unemployment rate is just a few tenths of a percentage points above the cyclical lows reached before the 2008-09 global slump. All of this happened despite a big increase in labor force participation. While the Hong Kong success story of course can be partially attributed to the boom in mainland China, this success alse reflects its relative laissez faire policies. It also shows that there is nothing inevitable about higher unemployment-and that trade with China and other low income countries does not cause unemployment. New York Senator Charles Schumer, arguably the leading China basher in the U.S, Congress is at it again. But this time, he is even more illogical and irrational than usual. His main critique against China has for long been that they are selling us their goods to cheap. But now he attacks China for selling "rare earth metals" at a too high price. But if China had complied with his long standing request to increase the value of the yuan, what effect would that have on the cost of Chinese "rare earth metals"? Clearly, it would make it more expensive. But now Senator Schumer attacks China for in effect complying with his demands. Why Is The Left Pro-Inflation? Despite the fact that the left claims to abhor rising inequality and despite the fact that there is strong evidence that the intended and achieved purpose of "quantitative easing" is to make the rich richer, the left is nevertheless overwhelmingly pro-inflation. Why is that? For many, the primary reason is that they are ignorant about the redistributive effects of inflation because they cling to what I think should be called the "Scrooge McDuck myth". They believe that the rich is like the fictional character Scrooge McDuck, with all of their money in the form of physical cash in a large money bin., who will lose if the purchasing power of money falls. Yet in real life, it is probably not much more common for the rich to hold a significant part of their assets that way than they share another of Scrooge McDuck's characteristics, namely being an antropomorphic duck. Instead, they hold most of their net worth in stocks or other assets which benefits from inflation. The other important reason is that inflationary policies strengthen government, and for many leftists that is more important than equality. The most important way inflationary policies both strengthen governments by making it cheap for them to engage in deficit spending when the central bank buys their bonds with money created from "thin air". Furthermore, if inequality is increased, especially in the form of making already rich Wall Street bankers richer, then this will strenghten the case for more redistribution from the government. Thus, some of the leftists who understand the effect of inflationary policies but views big government as more important than equality, this may be another reason for them to support, even though they are unlikely to make that case openly. Advocates of tax cuts are often accused by the left of advocating "trickle down economics", which is the idea that if you give the rich a lot of money, it will trickle down to the rest of the population. In reality, the economic case for tax cuts certainly doesn't lie in any "trickle down" idea, something which is illustrated by the fact that it applies to tax cuts for people with low or moderate income as well. Instead, it is based on the insight that if you improve incentives, then more wealth will be created. However, as is pointed out here, Bernanke is in fact making the case for "quantitative easing" on the basis of "trickle down economics", when he says it will boost the economy by the "wealth effects" that higher stock prices creates. And as the richest 1% in America owns 51% of stocks and mutual fund assets while the bottom 50% only owns 0.5%, "quantitative easing" is thus a big redistribution scheme in favor of the wealthy. Ironically, most of the leftists that complains the most about the increase in inequality is in favor of this inequality increasing scheme. Because of its limited geographical size, Luxembourg is sometimes perceived as a micro state similar to Liechtenstein. Yet while Luxembourg is indeed small, it is not that small. Luxembourg is with its more than 500,000 people roughly 14 times greater than Liechtenstein. It is also a lot greater in terms of population than Iceland with its 320,000 people. Luxembourg has many unusual characteristics. It has a work force of 229,000 people-yet employment is 352,000. This is possible because 136,000 more people live in neighboring countries and work in Luxembourg than vice versa. Of the people who do live in Luxembourg, some 43% are foreigners. Of those foreigners 86% comes from other EU countries. For some unknown reason, Portugal is the by far biggest country of origin. One explanation for this could be Portugal's relatively low income, yet there are few immigrants in Luxembourg from other low income EU countries like Greece. Exports are 160% of GDP, something which is possible because most input is imported. Luxembourg has the by far highest per capita GDP in the EU, at €75,000 or $100,000, more than twice as high as in the United States and neighboring Germany, Belgium and France. Because of this, Luxembourg's GDP is larger than that of many countries with larger populations, including Cyprus, Estonia, Latvia, Lithuania and Slovenia. However, because Luxembourg has a net factor income deficit with abroad (largely related to the high number of workers living abroad) constituting 31.5% of GDP, GNP per capita is a lower €51,500 or $68,500. That is however still far higher than all other EU countries as well as the U.S. and all other OECD countries except for Norway. All of these facts, and more, can be found here. Mark Griffith and Moti Levi has edited a book about the financial crisis, called Collateral Damage: Global Crash Phase Two, containing interesting articles about the financial crisis from 27 different authors, one of whom is me. My contribution discusses the Swedish banking crisis in the early 1990s and the lessons it and the response from the Swedish government teaches us today. I was going to recommend you to buy it through the Amazon.com link you see at the right side of the blog since that would enable you to support this blog at no extra cost to you, but unfortunately that will right now (January 13, 2011) only get you to a link where it is asserted that the book is out of print, which it isn't. After having contacted Mark Griffith about it, he informs me that this is the result of some problem at the American Amazon.com, which will hopefully and probably be resolved soon. If you can wait a week or so, then hopefully you can order it that way then. However, Mark also informs me that the book can be ordered immediately at the British Amazon.com at only £11.50, for those of you who are impatient. But regardless of whether you can wait or are impatient, I recommend you to buy the book. Nick Rowe at the Worthwhile Canadian Initiative notes that the U.S. has suffered the second smallest drop in GDP among G7 countries, yet also suffered the biggest drop in employment and asks why that happened. One part is simply statistical discrepancy. In Q1 2007, gross domestic income was 1% bigger than GDP, now it is 1.3% smaller. In theory they should be exactly equal as they are simply two aspects of the same real world phenomenon , but they aren't because they come from different data sources. As the income numbers are largely derived from employment numbers, this explains more than 2 percentage points of the apparent "high productivity growth". Note that the statistical discrepancy explanation holds regardless of whether you think the GDP number has underestimated the depth of the recession or whether the income and employment numbers have exaggerated the depth of the recession, or a combination of the two (I for one thinks it is a combination, but that the weaker employment/income numbers come closer to the truth). In any event, they mean that productivity increased less than the GDP to employment numbers at first glance suggests. Still, even after correcting for this, productivity in the U.S. has increased a lot more than elsewhere. One part could be that the U.S. has experienced more sticky wages mainly due to more "generous" unemployment benefits, something which in particular has depressed low productive employment. These more sticky nominal wages combined with lower inflation have boosted real wages and productivity at the expense of employment. Meanwhile, other countries have had more flexible real wages and Germany in particular has adopted policies which has limited job losses, such as lower unemployment benefits and incentives for employers to reduce working hours instead of the number of employees when demand drop. It is difficult to believe that it was just 3 weeks ago that I wrote that the spread between regular Fed Treasury securities and inflation-protected ones had risen to 200 basis points. Now the spread is up to 227 basis points (as of this writing), as the nominal yield has gained another basis point, while the "inflation-protected" yield has dropped 26 basis points. For the fifth month in a row, the U.K. trade deficit was at or somewhat above £4 billion in November. The 3-month deficit was therefore £12.2 billion, up from £7.8 billion in the 3 months ending November 2009. At the current rate of somewhat more than £4 billion per month, the deficit is exceeding the previous record level of £3.5 billion per month reached in 2007. There have thus really been no correction of the imbalances that created the crisis. There are two reasons for this: the high inflation rate and the high budget deficit. The high inflation rate means that the real depreciation of the pound since 2007 have been a lot smaller than the nominal depreciation. Furthermore, by pushing real interest rates far below the levels seen in most other countries, it has encouraged borrowing and discouraged savings, counteracting the little real depreciation there has been. The other reason is the big increase in the U.K. budget deficit. Unlike the high inflation rate, this will howver likely start to correct itself this year as the governments austerity program is implemented. The continued high inflation rate as well as euro area austerity programs will likely push the U.K. trade deficit higher, while the austerity program will push it lower. It remains to be seen which of these factors are more powerful. Robert Murphy points out that instead of reducing the payroll tax for employees, it would have been better to reduce it for employers as it lowers labor costs and would therefore increase employment. If wages had been fully flexible, it wouldn't have mattered whether or not it was employees or employers had their payroll tax reduced. But since they aren't fully flexible for various reasons, a tax reduction for employers is the most effective way to boost employment. Tino Sanandaji has a great post where he demolishes Paul Krugman's argument that Texas really isn't doing any good. He points out that not only has Texas had higher population growth, but has had stronger growth in employment relative to population and has also had higher per capita growth. It could be added that while per capita income is still seemingly higher in California than in Texas if you compare nominal income levels, this probably simply reflect a higher cost of living in California and not a higher real income. The cost of housing in particular is a lot higher in California. In its biggest city, Los Angeles, an average house was priced at $629,000, compared to $198,000 in Houston, the biggest city in Texas. The difference in median rent was a lot smaller, but still quite big, with the median rent being $1,094 in Los Angeles and $809 in Houston. If you take the lower cost of living in general and lower cost of housing in particular into account, real income is probably higher or at least very similar in Texas compared to California. Daniel Gros has an interesting article that provides a follow up on my post on the effects of Japan's rapidly ageing population. Gros shows that more than the entire 1.1 percentage point gap in growth during the last decade between Japan and the United States can be attributed to higher growth in the working age population in the United States. Indeed, GDP relative to the size of the working age population has in fact grown 0.5% per year faster in Japan. However, given that the 2000s were arguably a lost decade for America too and given the negative effects of its changing population structure, it is still right to call it a lost decade for Japan too. Today's U.S. employment report was overall somewhat weak-at least compared to many of the other stronger reports recently released. The household survey was this month somewhat stronger than the payroll report, following two months of very weak household surveys. It wasn't as strong as the drop in the unemployment rate suggested though. Most of that drop was the result of a decline in the labor force participation rate, which dropped to a record low 64.3% from 64.5% the previous month. The employment rate rose to 58.3% from the cyclical low of 58.2% the previous month. That is still very bad. The payroll survey showed a gain of 103,000, barely sufficient to keep up with population growth. The private sector and the federal government continued to add jobs, something which was partially counteracted with continued job cuts from state and local governments. Meanwhile, the average work week was unchanged, and average hourly earnings rose a mere 0.1% (likely zero or negative after adjusting for inflation) suggesting together with the moderate employment increase a modest gain in aggregate nominal labor earnings and even smaller or flat change in aggregate real labor earnings. All in all, most economic reports recently released indicate a slight acceleration in the U.S. recovery. This employment report would by contrast indicate that the recovery continues at the previous ver modest pace. Previous years, my posts (see here for 2009 summary, and here for 2008 summary) summarizing yearly exchange rate movements have been very popular so I will write another one this year. As always, the yearly summaries fail to reflect some of the intra-year movements, yet they are still useful and interesting. 2010 was generally a weak year for the U.S. dollar, though not quite as weak as 2009. This was of course a result of QE2. The Australian dollar was for the second year in a row the second strongest currency of those included. The difference is that the yen, the Singapore dollar and the Swiss franc who were among the weakest currencies in 2009, was now together with the Aussie the strongest currencies. In the cases of the yen and the Swiss franc this was likely due to "safe haven" demand following the European debt panic, and in the case of the Singapore dollar this was due to a decision of the Singapore monetary authority to use the exchange rate to hold down consumer price inflation. Other 2010 winners, like the Brazilian real and the New Zealand dollar had more moderate gains this year as Brazil imposed taxes on foreign investments to limit the appreciation of the real and as New Zealand raised interest rates a lot less than Australia. And yet another 2010 winner, the Norwegian krone was along with the U.K. pound and the euro the only currencies to depreciate against the U.S. dollar. Considering the gain in oil prices that is somewhat mysterious and I am not sure of why it was so weak. It could perhaps be a reaction to 2009 over-shooting or it could be related to Norwegian authorities use of its sovereign wealth fund to hold down the value of the krone. Why the euro was so weak seems obvious. The weakness of the pound is likely to be in part related to the new government's austerity program which have created expectations of continued rock bottom real interest rates. As in previous years, the below numbers describe changes in value relative to the U.S. dollar. November 2010 German factory orders came in a lot stronger than expected, rising 5.2% from the previous month and 20.6% compared to November 2009 after adjusting for calender and seasonal effects. Compared to the cyclical low in February 2009, factory orders is up by a full 45.5%. Yet because February 2009 factory orders were 37.8% lower than the cyclical high reaced in November 2007, November 2010 factory orders were still 9.5% lower than during the cyclical peak exactly 3 years earlier. In 2003-05, German chancellor Gerhard Schröder implemented a free market reform agenda called "Agenda 2010" which included tax cuts, unemployment benefits cuts and less strict labor regulations. What has happened since? Well, while most other countries have seen unemployment increase, German unemployment has dropped from 9.7% in 2004 to 6.8% in 2010 (annual averages). From having an unemployment rate significantly above the EU average, Germany's unemployment is now significantly below it. What's more, the labor force has increased nearly 1% , despite the fact that Germany, like Japan, has seen its a decline in the overall population and an even greater decline in the working age population. No numbers for the entire period can be found on the German statistics office web page, but extrapolating the 2003-06 period, it seems that the working age population is decreasing at a rate of 0.5% per year, implying a cumulative decline of 3% between 2004 and 2010, something which in turn means that the relative labor force participation is up by 4%. Add to that the decline in unemployment, and the German employment to population rate is up by 7% between 2004 and 2010, a period when as mentioned above most other countries have seen a decline in the employment to population ratio. While there are probably other factors involved too, the German experience is a vindication of "Agenda 2010" and supply-side policies in general. Associated Press reports that Japan's population fell by 123,000 in 2010, or by roughly 0.1%. Yet the working age population is declining even faster. In late 2004, there were 85.08 million people aged 15 to 64, but by late 2010, that number had dropped to 81.07 million, an average annualized drop of 0.8%. Meanwhile, the number of people older than 65 rose from 24.88 million to 29.46 million, an average annualized increase of 2.9%.This increase has been almost entirely concentrated in the above 75 years group. Japan's problem isn't so much the moderate decline in the overall population, but rather the dramatic increase in the number of old people relative to the number of available workers. Dean Baker tries to make us believe that this is not a problem because he argues that it can be made up for by productivity growth. But first of all, the point is that this change in population structure will reduce living standards compared to if it hadn't changed. There is no reason to believe it will boost productivity growth. If anything the opposite is true as the growing number of retirees will lower savings and therefore also investments. With the working age population likely to shrink relative to the overall population by about 20% until 2050, this implies at least a 20% reduction in average income compared to if the population structure hadn't changed. Secondly, simply transferring productivity growth isn't that easy since it implies higher taxes or alternatively that retirees will get even less compared to when they were working. The only thing Baker is right about is that one way to combat this is to make older workers stay longer in the work force. That is the by far most effective way to deal with this problem because not only will it increase the number of workers, it will also reduce the number of retirees. But as most workers would all things being equal prefer to retire earlier (In France, Greece and elsewhere, workers have striked to protest increases in the retirement age), that solution would also represent a negative effect of the change in population structure. Nick Rowe at the Worthwhile Canadian Initiative argues that income effects from higher prices really don't exist because the loss for buyers is matched by an equal gain for sellers. Therefore he argues that price increases have no aggregate income effects, and that we should therefore only focus on substitution effects. I agree with him that substitution effects are usually more important than income effects (see here my article on why the income effect is irrelevant when it comes to the issue of whether to have high or low levels of taxes and government spending). And his point about the non-existence of aggregate income effects is correct in some contexts, specifically when the higher price is the result of higher demand. Here the losses for the buyers are matched by gains for the sellers. However, higher prices can nevertheless be associated with lower real income. One is a scenario that he acknowledges, namely when a country is a net importer of the higher priced good. Yet he dismisses it by pointing out that when a country is a net exporter of the higher priced good it gains. But setting aside for a moment the caveat for the latter that I discuss below, this only goes to show that income effects can exist for countries for that reason-and that these income effects can be both positive and negative. The other scenario that he fails to mention is when higher prices are the result of lower supply. Suppose for example that for some reason crops fail. That will push prices higher, but because quantities sold will be lower, the income gains for the farmers will be lower (maybe even non-existent or negative) than the income losses for food buyers. It is true that in this case it could be argued that the price increase here is a symptom of lower output (and its corollary lower income) rather than the cause of the income decline. But if we reason this way, we could argue that the price increase has a positive effect, as the price adjustment limits the negative effect from lower output. If for example the state had banned the price increase, the income loss would have been even greater. Here the price increase is thus a symptom of something negative, yet it is also something which limits the negative effects of the negative event it is a symptom of.